Crow Hill Rugs are traditionally hand woven "rag" rugs with a timeless appeal. I weave Crow Hill Rugs under high tension with my large powerful loom. Even the largest rugs are woven tight and lay flat on the floor. Crow Hill Rugs are exceptionally durable. I make them with strong cotton/poly rug warp and an ecologically friendly mix of recycled clothing and new fabric scrap. I first wash and then shrink all material, and then cut or tear it into strips. As a result, Crow Hill Rugs are machine washable! For thirty years, I have used fabric, and the rug making process, to study the interaction of color. Some of my rugs are a subtle mix of color. Other rugs feature a banded style in which color groups flow as waves that appear three dimensional and monolithic. I enjoy creating color contradictions, like blues that appear hot instead of cool, as in the photo above, and combinations that create illusions of depth and transparency. My overall goal is to generate emotional resonance. Crow Hill Rugs can be made to order in one piece up to 8' wide and 14' long. Custom orders are $30.00 per square foot, plus shipping. My order minimum is $300, or 12 square feet. 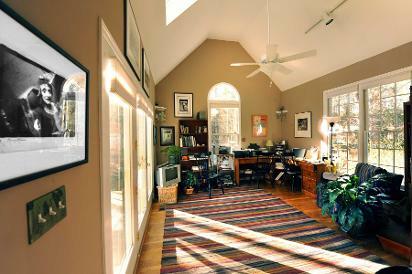 Crow Hill Rugs can enhance your existing living space, unite various interior elements, or take you in new directions. Orders start with an exchange of information about color and size. 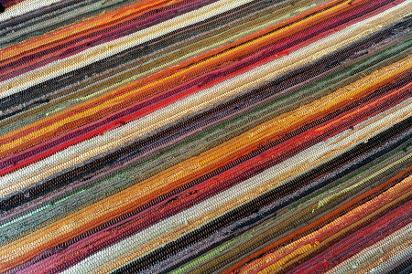 This 8'x12' rug was woven in a banded style where six "pics" of one color hue transition into another. Five different hues rotate through the rug. The colors of this 8'x11' custom were based on the chair seat upholstery. Scrap pieces of actual upholstery were woven into the rug. To increase textural interest, I used 15 additional fabrics, like accidentally felted sweaters, blankets, corduroy, linens, and silk. Many close color tones, like three or four shades of wine red, for example, combined with several shades of muted lime green, enhance the color resonance effect. This rug unites the wall, floor, and foliage tones, and adds a spark of red, providing comfort and protection for the hardwood floor. The backdrop rug in this photo is a banded style 6'x9' that transitions from pink grey to mauve grey, lavender grey, violet grey amber reds, and pale yellow bronze. Rolled, on top, is a 2'x6' small runner used to bridge the distance from sink to stove to fridge. It is also a nice size for short hallways, as an entry rug, and beside a bed. It illustrates heavy textural possibilities as does the third rug, a standard multi-purpose 2'x4' throw.